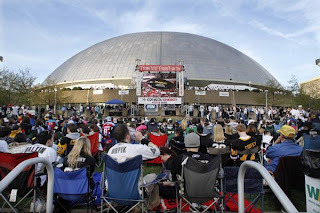 Saturday night the Penguins closed out the Senators in dramatic fashion with a Game 6 overtime goal from Pascal Dupuis, but the series was not always so closely matched. After their Game 1 hiccup, the Pens essentially took control of the series and refused to give it back. Sidney Crosby was remarkable racking up a total of 14 points (currently leads the league), not to mention that he won Game 2 by himself and had a number of multi-point games. 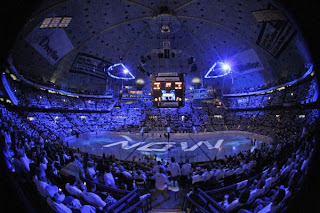 There were many times when nobody else on the ice could even come close to his intensity and drive and he showed that he is ready for another deep run into the playoffs. 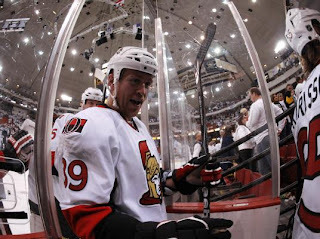 Peter Regin scored several key goals for the Senators and was consistently their hardest working player on the ice. He deserves a pat on the back for his hard work. Maxime Talbot returned to his playoff form and helped the Pens in a variety of ways, including passing, scoring, fighting, and of course momentum and energy. Max was always one of our best playoff players, and will be extremely important for the rest of the season. Though Dupuis's goal was what everyone will remember, I believe the real turning point was Kris Letang's game winning goal in Game 2 from an incredible pass by Sidney Crosby. 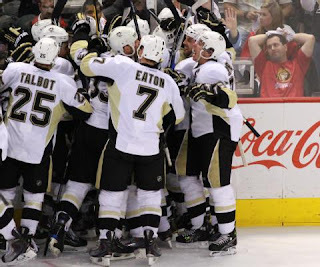 This was just minutes after Sidney Crosby saved a sure goal from Ottawa. Andy Sutton injured two Penguins, Jordan Leopold and Tyler Kennedy. Sutton was just an annoyance out on the ice, and did not help his team very much. 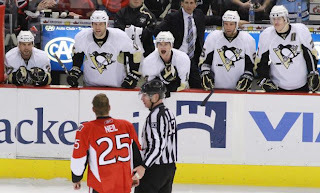 He did deliver two painful blows to the Pens with injuries, with the most contraversial being his alleged elbow to the head of Leopold in Game 2. 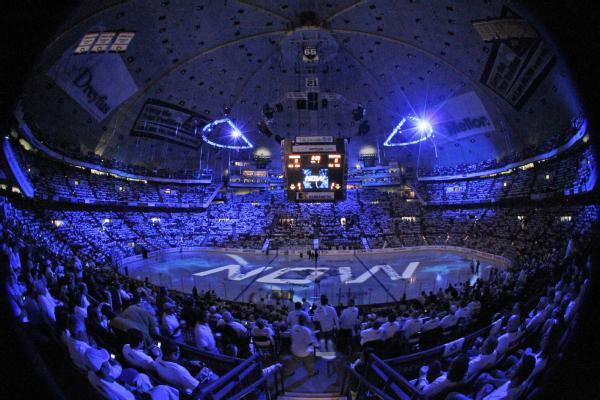 Mellon Arena pregame ceremonies before game 1. 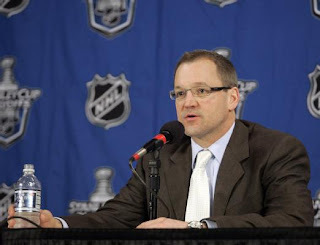 Coach Dan Bylsma reflects on the Pens Game 1 5-4 loss. Max Talbot gives a friendly warning to Jarkko Ruutu, who attempted to rough up Sergei Gonchar after the whistle. 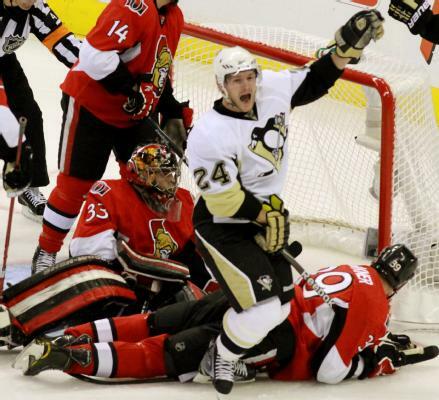 Sidney Crosby makes a diving save behind Fleury to prevent the go-ahead goal from the Sens during Game 2. Members of the Pens celebrate their victory in Game 3. Sidney Crosby raises his stick after scoring in Game 4. 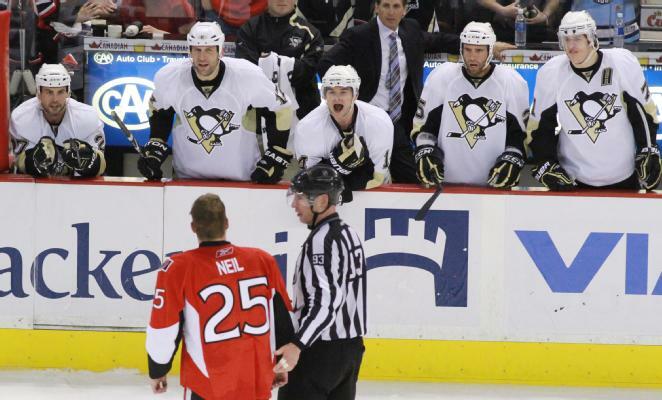 Chris Neil gets taunted by members of the Penguins bench on his way to the penalty box. 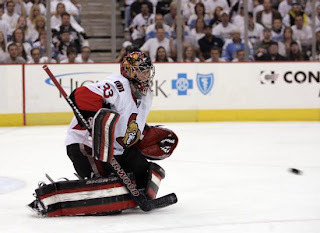 Pascal Leclaire makes one of his 56 saves in Ottawa's marathon Game 5 win. 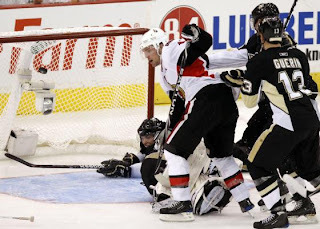 Matt Carkner celebrates after his triple OT goal to give Ottawa the win in Game 5. 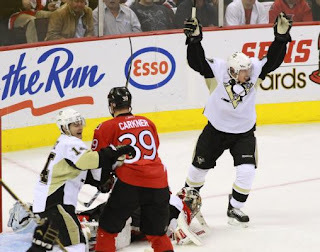 Matt Cooke celebrates after scoring the Pens first goal in their Game 6 comeback. 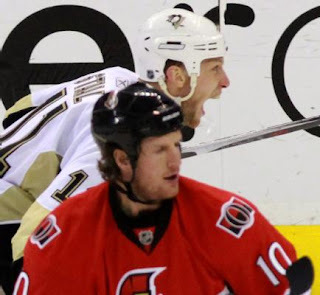 Jordan Staal roars in celebration of Pascal Dupuis's series winning Game 6 overtime goal.